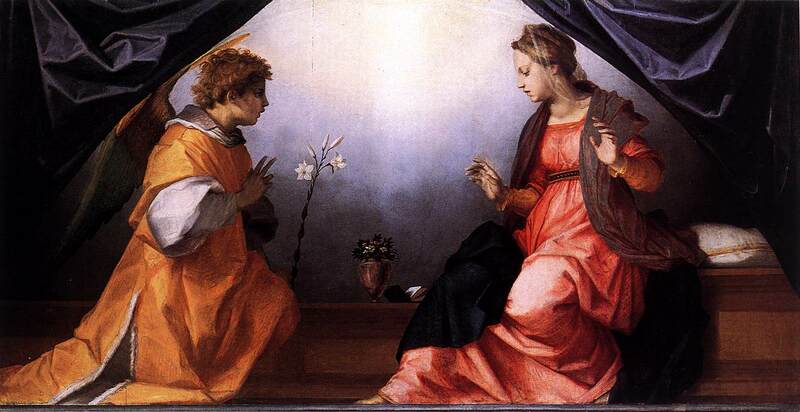 Happy Solemnity of the Annunciation of the Lord to all readers. Here in Arundel and Brighton, an announcement was made over the weekend that we have a new Bishop, Bishop-elect the Rt Rev. Richard Moth. Many congratulations to him and the Bishop-elect can be assured of my poor prayers as he endeavours to bring healing and the charity which comes from God to the Diocese. He has quite a 'job' on his hands, in the words of his predecessor. I pray especially that he will bring hope and encouragement for the clergy who have been 'through the mill' both before, during and after the sudden and unexpected resignation of Kieran Conry. Perhaps today, more than in recent times, clergy must surely need the support, encouragement and fatherly care of their Bishops set in authority over them. At this time, when so much appears to be going haywire in Rome, faithful priests must wish and pray that prelates watch over them with great care, affection and love as they endeavour to fight for the triumph of not just mercy, but justice and the proclamation of the saving truth of Jesus Christ our Lord, at a time when it confusion regarding the divine truths of the Holy Faith are under such threat from within the Church. What priests certainly don't need - and don't appreciate - is warnings coming from those placed in authority over them, by those senior figures who decide not to serve the truth of Jesus Christ, but instead who lord their authority over the clergy - in a manner which cannot be described one of humble service of the truth - so as to further an agenda that seeks to undermine Christ's teachings and the mission of the Catholic Church, that sacred mission that priests accepted upon their ordination. May the Blessed Mother of God, Mary, most holy, watch over the new Shepherd and Father to both clergy and laity, guiding him to serve in humility her Divine Son, bless and keep him and help him to bring healing to the Diocese of Arundel and Brighton. May he serve the People of God with great zeal, with great charity, with prudence and with fatherly care, most especially towards the clergy. May he show a special support to those clergy who are brave enough to speak out at a time of crisis in the Church over issues of pastoral concern which affect every priest in every Diocese, as they strive day by day to serve the Lord Jesus Christ and bring both truth and mercy to the souls in their care. Unless I am ill, dead, or happen by chance to be in another Diocese that day, I will see the new Bishop at the AMEX stadium. Laurence.What an insightful post!Nichols is a modernist and courts the world instead of The Mystical body of Christ.God Help him .Philip johnson. A most hearty salute to these Catholic priests of England and Wales who will not countenance "this English Church” clandestinely in the making. Love that Annunciation painting! A boyish-looking archangel needing to comb his hair! Happy Feast! Bishop Moth has adorable dimples when he smiles. Wonder if Nichols will be up for pope when Bergoglio retires or expires? Shudders. Well. Who can say, in the church of 'who can say?'. He is at least wearing clerics. 'my' bishop wears a tshirt and the occassional viscose vest, usually surrunded by clergy in similar mufty and you go...are you a religious man? Anyone know if there is a list lay people can sign in support of the priests? I am really pleased 'my' faithful priest has signed. Must remember to thank him for this brave move. Damian T at Spectator on line has published the list if you want to go and check. If there isn't a list for lay people, can someone start one? Bones? Marie, Thanks for pointing out that archangel! What a sweet touch. And I had to check out photos of Bishop Moth after Seattle Kim's 'dimples' comment. She's right! My prayers for the new bishop, and the priests who signed their Catholic letter, and for all here.